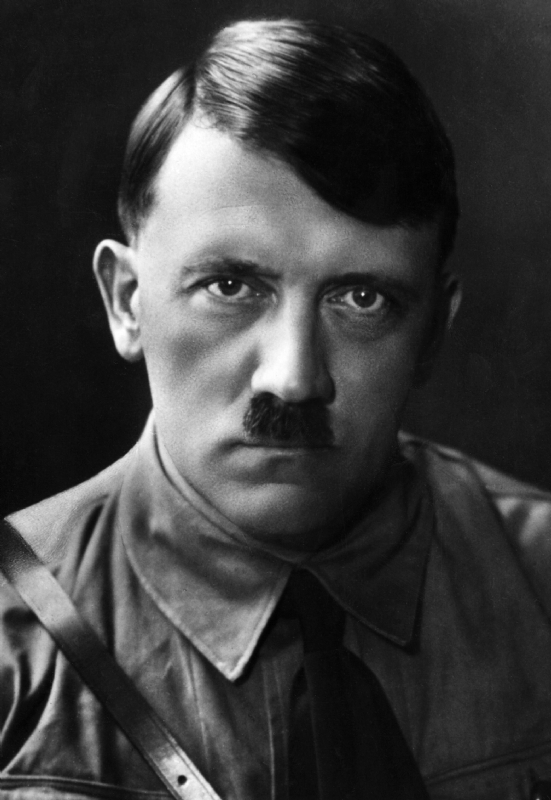 Adolf Hitler (born in Braunau am Inn, Austria–Hungary, died in Berlin, Germany) was a famous Criminal from Germany, who lived between April 20, 1889 and April 30, 1945. He became 56 years old. Adolf Hitler was "leader" of the National Socialist German Labour Party from 1921 and head of the government and state of the German Empire from 1933. He was Austrian by birth and background, but moved to Germany in 1913 and became a German citizen in 1932. He came to power after the economic crisis that occurred in Germany after the First World War and the collapse of the economy in 1929. Using propaganda and charismatic speech, he appealed to working-and middle-class economic needs, and struck nationalist, antisemitic and anticommunist tones. After coming to power, he founded the National Socialist dictatorship, "the Third Reich" in Germany. He banned all opposition parties and pursued political, ideological and cultural opponents and people belonging to different minority groups, racial or otherwise. At the same time, he restructured the economy and initiated major social programs and development of infrastructure and technology. He also promoted an expansive foreign policy, and Germany and its allies in the Axis powers controlled in most parts of Europe. On the other hand, he stimulated a neo and racist "blood and race" ideology, and committing systematic discrimination and subsequent prosecution of such Jews and Gypsies - which cost about six million European Jews lives in the Holocaust. He is born under the zodiac taurus, who is known for Security, Subtle strength, Appreciation, Instruction, Patience. Our collection contains 35 quotes who is written / told by Adolf. "Hate is more lasting than dislike"
"Words build bridges into unexplored regions"
"As a Christian I have no duty to allow myself to be cheated, but I have the duty to be a fighter for truth and justice"
"Great liars are also great magicians"
"I believe today that my conduct is in accordance with the will of the Almighty Creator"
"Who says I am not under the special protection of God?" "Germany will either be a world power or will not be at all"
"If you tell a big enough lie and tell it frequently enough, it will be believed"
"Humanitarianism is the expression of stupidity and cowardice"
"I go the way that Providence dictates with the assurance of a sleepwalker"
"All propaganda has to be popular and has to accommodate itself to the comprehension of the least intelligent of those whom it seeks to reach"
"Sooner will a camel pass through a needle's eye than a great man be "discovered" by an election"
"Anyone who sees and paints a sky green and fields blue ought to be sterilized"
"He alone, who owns the youth, gains the future"
"As soon as by one's own propaganda even a glimpse of right on the other side is admitted, the cause for doubting one's own right is laid"
"All great movements are popular movements. They are the volcanic eruptions of human passions and emotions, stirred into activity by the ruthless Goddess of Distress or by the torch of the spoken word cast into the midst of the people"
"Universal education is the most corroding and disintegrating poison that liberalism has ever invented for its own destruction"
"Struggle is the father of all things. It is not by the principles of humanity that man lives or is able to preserve himself above the animal world, but solely by means of the most brutal struggle"
"Any alliance whose purpose is not the intention to wage war is senseless and useless"
"Generals think war should be waged like the tourneys of the Middle Ages. I have no use for knights; I need revolutionaries"
"By the skillful and sustained use of propaganda, one can make a people see even heaven as hell or an extremely wretched life as paradise"
"Strength lies not in defence but in attack"
"Demoralize the enemy from within by surprise, terror, sabotage, assassination. This is the war of the future"
"I do not see why man should not be just as cruel as nature"
"Whoever lights the torch of war in Europe can wish for nothing but chaos"
"What good fortune for governments that the people do not think"
"The art of leadership... consists in consolidating the attention of the people against a single adversary and taking care that nothing will split up that attention"
"Mankind has grown strong in eternal struggles and it will only perish through eternal peace"
"If today I stand here as a revolutionary, it is as a revolutionary against the Revolution"
"I use emotion for the many and reserve reason for the few"